Leave the top, batting and backing separate. Do not pin or sew them together. Trim loose threads and make sure that all your seams are pressed and lie flat. Label the upper edge if your quilt top is directional; use a scrap of paper pinned to the upper edge. What seems obvious to you may not be obvious to the quilter. Avoid wavy borders. 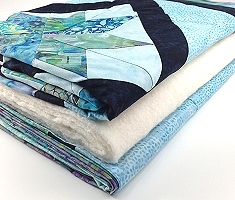 Instead of measuring the edges of the quilt top for your borders, measure the center width and length. If necessary, ease the edges and borders when stitching them together. If you are providing the batting, it must be at least 4 inches larger than the quilt top on all sides. Check packaged batting to make sure that it will lie smooth and flat. Confirm that the package label indicates that the batting is suitable for machine quilting. The backing should be at least 4 inches larger than the quilt top on all sides. Square up the backing. Trim off any uneven edges. Seams in the backing should have the selvages trimmed off. Press all seams and trim loose threads. If your backing is directional or you want it centered or positioned a certain way, please pin a note to the backing with your instructions. They can be brief--just a reminder to the quilter. Again, what seems obvious to you may not be obvious to the quilter. High thread count bed sheets may not make good backings for longarm quilting. Ask your quilter.